The business district is nearby, providing any kind of product or service one could want. The price per square foot for University Heights is $328, and the median sales price for single-family homes and condos is $364,000. You can find relatively inexpensive cottages and apartments as well as million-dollar homes. Spanish colonial revival bungalows can be found in the historic district of Shirley Ann Place between Monroe and Madison Avenues. Trolley Barn Park is a favorite place for families and their pets. It offers free Friday evening concerts during the warm months. The park was the site of a trolley repair barn in the 1950s. 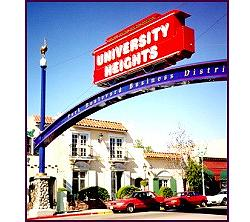 The University Heights Street Sign came about from a contest in 1995 and was erected in April, 1997. It is a tourist attraction depicting the various historical elements of the communities past and present. University Heights has a thriving LGTB community and is served by many hip bars open all night long, including Bourbon Street, Red Fox, Livewire, Lancers and Lei Lounge. Proximity on foot or by bicycle to North Park, Hillcrest and Balboa Park. Excellent food stores, including Henry’s, Trader Joe’s and Whole Foods. Wonderful restaurants include El Zarape, Sultan Banoo, Mamas Bakery, Dao Son, Parkhouse Eatery, Adams Avenue Grill, etc. Popular coffee houses include Starbucks, Monica's, Twiggs, Cream and Mystic Mocha. The community is festooned with images of ostriches, harking back to the Harvey Bentley Ostrich Farm from the early 20th century. The farm supplied not only meat and eggs, but also feathers and other raw materials. Interesting and varied shopping, including Persian Heritage Rugs, Florabella, Farid Interiors, Sun Decisions, Buddha’s Light Bookstore and Bud’s Liquor. Valuable services, including pet grooming, a smog inspection station, barber shops and hair salons, massages, coin-operated laundry, hydroponic supplies, acupuncture, realtors and a moving center. There are at least twelve religious, civic and professional organizations in University Heights, including Baptist, Reformation, Jehovah’s Witness, Buddhist and Swedenborgian churches. The University Heights Community Association meets on the first Thursday of the month at 6:30 p.m.